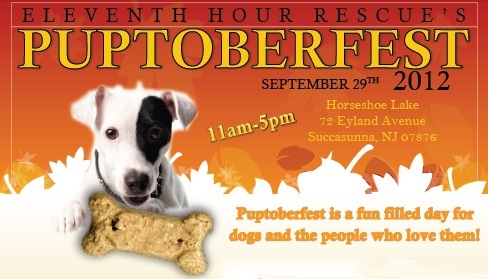 On September 29, 2012 Don’t Be Cruel will be participating in the Eleventh Hour Rescue’s Puptoberfest. It will be held at the Horseshoe Lake on 72 Eyland Avenue in Succasunna, NJ. The fun-filled day will start at 11am and end at 5pm. There will be live music from Frantic Band. Radio stations, WDHA 105.5 FM and WMTR 1250 AM will be on site to entertain you while you shop through various vendors or run the agility course with your K9 pal! Also at Puptoberfest, there will be keepsake photos, games and contests for dogs (and kids too! ), paw painting, K9 Good Citizen Testing, adopters parade, doggy fashion show…and much much more! This event will benefit Eleventh Hour Rescue. Eleventh Hour Rescue is a nonprofit 501c3 that saves dogs & cats from death row. They have rescued thousands and continue to rescue more at their “11th hour”. They provide animals in need with a place to live, food, medical, & lots of love until they find their forever homes. They rely solely on the generosity of supporters & volunteers. Puptoberfest is a day where their volunteers get to see their beloved animals walk into the park with their tails wagging, heads held high, shiny, happy and loved by their new families. It’s their “Pay Day”. To see where we will be next, view our Don’t Be Cruel Events page. This entry was posted in Local NJ/NY Events and tagged Eleventh Hour Rescue, Frantic Band, Puptoberfest 2012, WDHA 105.5 FM, WMTR 1250 AM on August 8, 2012 by Belkis Cardona-Rivera.